It’s been awhile since I last tabled at Anime Expo. Two years to be precise. I tabled here for the first time in 2010 and the Artist Alley felt like a quarter of the size it was back then. To be honest, I sort of dove in a little unprepared because of all the work involved with Kickstarter and getting the books in leading up to AX. I had my books, a few signs here and really not much else. I went nuclear minimal on this. Overall, it was definitely an awesome convention! You can view the photos I took of the con here on my Facebook page. Final Update: Polterguys CH6 15-28 are up! Click to read the last set of updates! That’s it, guys. Hope you enjoyed! I’m so very grateful you all have made the experience of launching my first book very meaningful for me. Thank you for reading, sharing and appreciating all this hard work. I hope to bring you Vol. 2 as soon as possible with better resources and some experience in my corner. I hope to see you all again for when that happens! 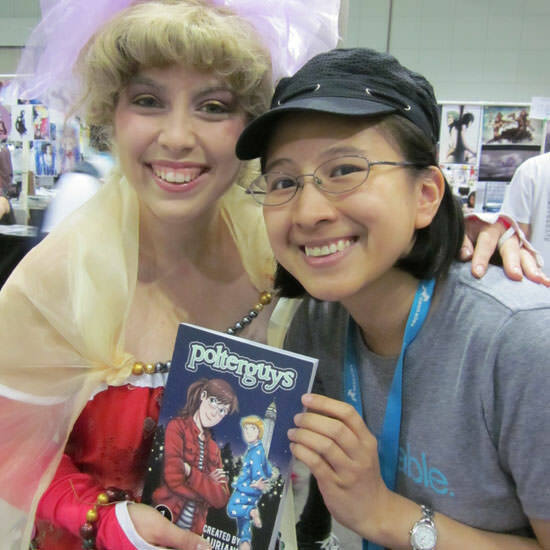 Here’s a wonderful review of Polterguys from Examiner.com’s Jaysen Headley. (author of The Class ) Very grateful for the feature and the high praise. If you’re in the Los Angeles area, you can find me at Anime Expo’s Artist Alley Table F17 all this weekend! 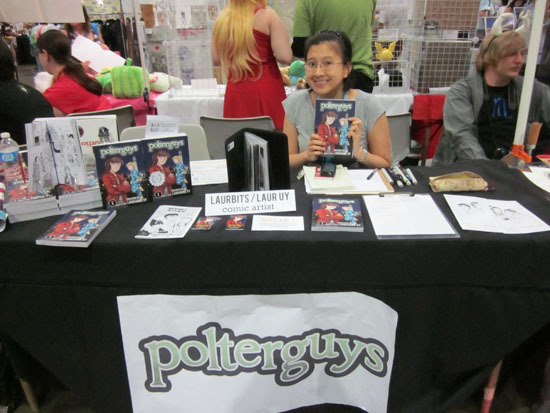 I’ll be there through Monday selling the first few copies of Polterguys Vol. 1. 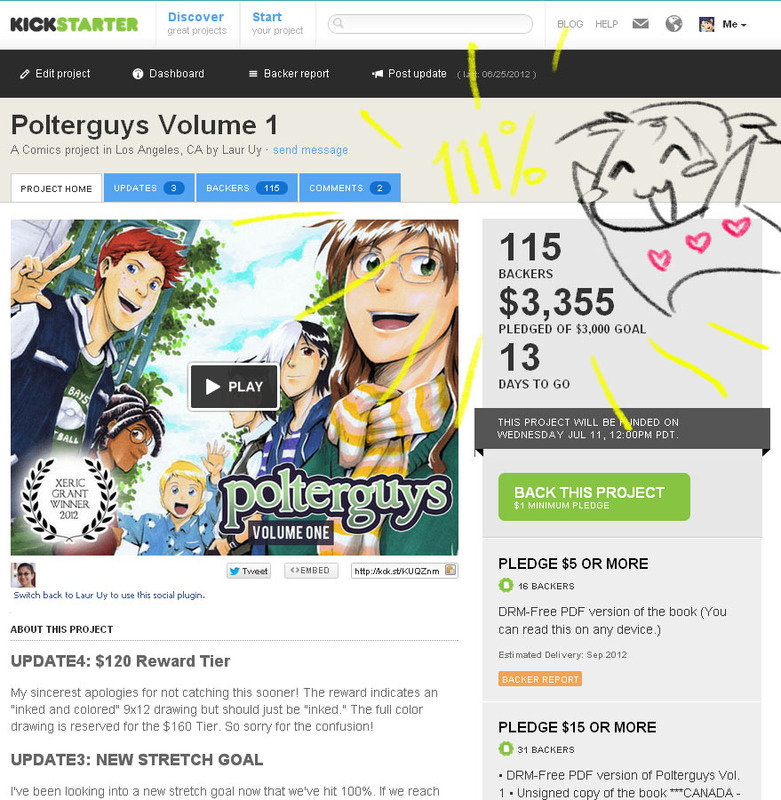 Polterguys Vol 1 Kickstarter is funded! 100% funded with two full weeks to go! Thanks so much for making this happen, guys. I really had no idea if this was going to work since I’m a nobody on the interwebs but somehow, through your generous shares and support, we managed to make it! Y’all are probably sick of me saying thank you over and over but I WILL KEEP SAYING IT – you guys are the best. Thank you from the bottom of my heart. I’ve added a stretch goal of $4,000 to unlock a bonus comic for the Polterguys Vol. 1 companion. There’s still lots of time to pledge if you haven’t had a chance yet. Check it out! There are several moments watching La Luna in the theater when I was actively fighting back tears. It sounds ridiculous, I know! It’s a PIXAR short. Nobody dies. Laur, you are an emotional wreck. This is a post attempting to explain my emotional reaction to animated imagery, the efficacy of music set to it and the power of transcendent storytelling. Minor SPOILERS after the cut.